Discovering The Blind Shake is one of the smarter things I've done over the past few years (thanks again @swamipat). Their potent blend of noise, punk and hooks have made quite an impact on me. Shadow in The Cracks is two thirds of The Blind Shake (Jim & Mike Blaha) and chances are if you dig The Blind Shake, you will dig parts of this record as well. I won't pretend to like this quite as much as I like The Blind Shake. One of the things that I think really defines that band is how deceptively catchy they are. Sure those hooks are buried deep in the grime, but they are there. Shadow In The Cracks is much more of a dissonant record. Not to say that there aren't any hooks, but the grime is thicker and there is a more experimental sound. If anything, you'd have to say these are much more in line with the further out there, weirdo Blind Shake songs. 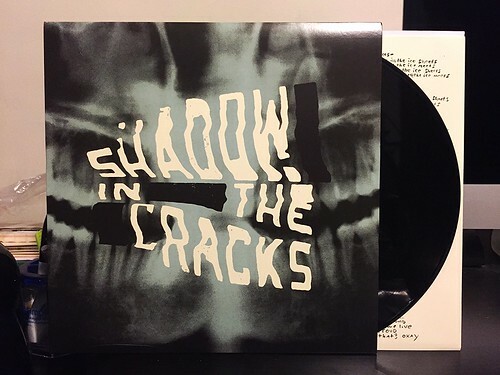 This Shadow In The Cracks album is an economical nine songs and thirty minutes long. It's long enough to let the ideas of each song play out, but not so long that they become self indulgent or overbearing. It's an interesting listen, with lots of unique ideas. I hate to bring up The Blind Shake in nearly every sentence in this review, but that's going to be your touchstone as what to expect. If you like one, it's probably likely that you'll like the other as well.